After the success of PopCap’s Peggle and King’s Papa Pear Saga (among others), RoyalCactus has released its own take on the peg-destruction formula on Facebook: Yummy Balls. The game sees players dropping candies from the top of the screen, which then bounce off of pegs and accumulate points before dropping into buckets at the bottom of the screen. Each level has a different layout of rectangular and round shapes, and has a different overall goal, like clearing a certain percentage of shapes from the screen or clearing all symbols of a specific color, as examples. Players earn up to three stars on each stage, and receive bonus points for any leftover shots they had in their pack when completing the level’s requirements. As players complete stages, they’ll unlock power-ups that make things easier going forward. A “division” power-up, for instance, splits a single candy into two, destroying more symbols without wasting another shot from the pack. Meanwhile, lighting power-ups can be used to destroy multiple pegs with the same shot as lightning bolts shoot across the screen. Players can compare their scores on each stage with friends, and they’re free to go back and play previously passed levels to earn more stars or increase their high scores. 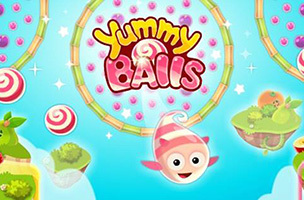 Yummy Balls was released late last year, and is on the rise on Facebook. The game currently sits at over 651,000 monthly active players and climbing, according to our app tracking service AppData. It’s available to play for free on Facebook.